Benchmark, a global hospitality company, announced plans to open The Grove Resort & Spa, an 878-room all-suite resort in Orlando, located on Lake Austin and just minutes from Walt Disney World. Billed as the largest development of its kind currently underway in Orlando, The Grove Resort & Spa is scheduled to open its first phase in February 2017 with 184 two and three-bedroom guest suites. The Grove Resort & Spa aims to bring a new type of hotel destination to the area with an expansive 106-acre blueprint that incorporates a portion of Central Florida’s conservation grounds. 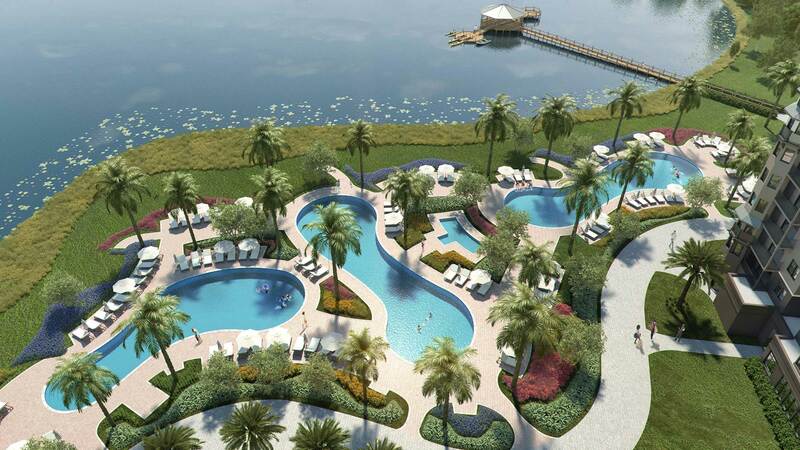 Its family-friendly water park and amenity package will include a dual-rider surf simulator, a winding lazy river, four swimming pools, and a variety of dining options that include full-service restaurants, bars and more. The Grove Resort & Spa will welcome destination weddings, family reunions, meetings and other social and corporate events. With 6,000 square feet of flexible indoor space and poolside, lawn and garden alfresco venues for intimate meetings or large groups, The Grove will accommodate up to 300 people. Dining at The Grove will include the 221-seat, indoor/outdoor restaurant, Valencia, serving Spanish, Italian, and French-inspired dishes for breakfast, lunch and dinner. Longboard Bar & Grill, located at Surfari Water Park and Springs Bar & Grill, located at The Springs Resort Pools, will both serve traditional bites such as hamburgers, chicken wings and pizzas with all ingredients in-season and locally grown. The Grove’s Escape Spa will offer a full service menu inclusive of body and facial treatments, manicures, and pedicures; a 2,000-square-foot fitness center will house brand-new exercise equipment. The Grove Resort & Spa is owned by a joint venture between certain affiliates of Westport Capital Partners and BTI Partners, with BTI Partners as the development partner. Houston, Texas-based Benchmark will manage the property as part of its signature Benchmark Resorts & Hotels portfolio.